The Autumn issue of Isis-Seshat, the quarterly issued official journal of the worldwide Fellowship of Isis (or FOI; furthermore, I serve as Isis-Seshat’s Executive Editor), featured the bulk of my lengthy interview with one of Kemetic Reconstructionism’s most ardent and articulate champions, Rev. Ptahmassu Nofra-Uaa. He is the co-founder of Hwt-Ka-Ptah/ Temple of Ptah Nevada, a Kemetic Reconstructionist temple dedicated to the celebration and restoration of authentic ancient Egyptian spirituality. He is also High Priest of Per-Auset/Temple of Auset Nevada, a nonprofit educational religious organization representing the Egyptian tradition of the Goddess Auset/Isis. Ptahmassu was legally ordained as a Priest of the Goddess Auset in 2002 by the Rt. Rev. Lady Loreon Vigné, Archpriestess of the Temple of Isis in Geyserville, California–a state and federally recognized church founded to honor the Divine Feminine as embodied in the Egyptian Goddess Isis. In 2004, he was ordained by FOI co-founder Lady Olivia Robertson as a Priest-Hierophant serving the Goddess Sekhmet. 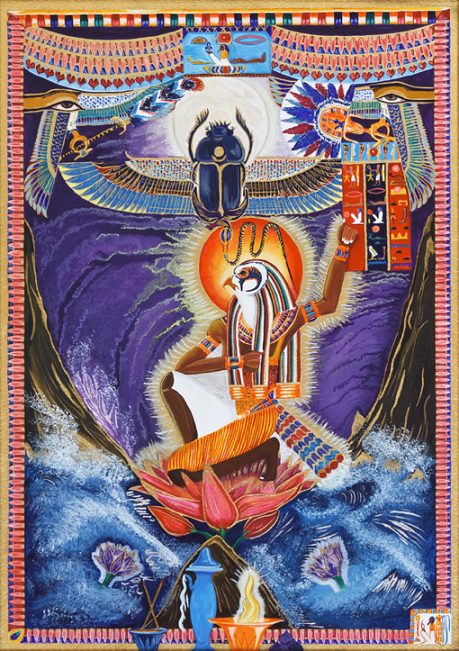 Ptahmassu Nofra-Uaa serves the Neteru as a Kemetic iconographer; as founder of Icons of Kemet, he uses his skills as a painter and craftsman to create icons of the Goddesses and Gods of ancient Egypt in order to further the restoration of Their ancient temple traditions. Not all portions of my interview with him found their way into the pages of Isis-Seshat, and it’s the theological discussions we had in particular that I would like to share here on my blog. Our conversation is completely unabridged, so brew a cup of tea and settle in for a passionate apologia of Kemetic Reconstructionism. I hope it will bring edification and inspiration to all polytheists (whichever Powers they honor in their devotional practices), and, in particular, adherents of Reconstructionist traditions. Me: I’m always excited to meet fellow devotional polytheists, whether or not they venerate the Powers of the eastern Mediterranean like I do. How did you first come to love the Neteru of Kemet? Ptahmassu Nofra-Uaa: I find that the label polytheist is pretty loaded these days…charged with a certain amount of controversy in dialogues taking place within various spiritual communities. One hears terms like “hard polytheist” or “soft polytheist,” and there are fierce debates going back and forth as to who is who, and what can or can’t be labeled polytheism. I’ve found myself having this discussion fairly frequently in my Kemetic work, with individuals who are very concerned with just how I identify the Netjeru (Gods) and Their relationship to Netjer, Deity in general. Am I, as a self-avowed polytheist, taking the stance that the Gods are wholly unique and distinct from the Creator God…as in Their own individual personalities that are self-determined, self-governing…or do I believe that ultimately the Netjeru are different forms and/ or manifestations of One Hidden Supreme Deity called Netjer? I have to admit that sometimes I find these –isms and debates over labels incredibly constricting, irritating, and distracting from the real work of service to the Sacred Powers. At the end of the day I put my emphasis on action, on cultic service and devotional work, not on philosophical speculation. Ultimately, the precise origins of the Gods—of any god—are beyond the comprehension of human beings. Our place is not to reason why, but to get down to the work of organizing our lives in such a way as to be of service, to the Gods and to creation as a whole. We can waste a great deal of precious time agonizing over this issue of ism—polytheism, henotheism, is Deity really One acting as the All or the Many—or we can choose to simply honor the Gods as Gods, as our Sacred Powers, and accept the limitations our mortality, our humanity carries in terms of how much we can ever really know Deity. That being said, we as human beings are defined by the language we use to express ourselves. There’s no getting around the significance our culture places on how we choose to label our identity, our beliefs, our lifestyle and manner of connecting with the world around us. I’m somewhat dissatisfied by the application of terms such as polytheism or henotheism to very ancient systems of belief that preexist the advent of such language or modes of thinking. To me it seems a bit out of place. I’m sure that the Ancients would have expressed it as, “We believe in the Gods. We honor the Gods,” period. To attach a philosophical framework to that…one that comes from another time and culture…seems very misguided to me. I believe in the Netjeru, the Goddesses and Gods of the ancient Egyptians, and I view the Gods I serve as wholly distinct, unique, and individual Sacred Powers, each carrying Their own personalities, manifestations, and spheres of influence. Are They related to the Creator God? Absolutely, just as human children carry on the DNA of their biological parents. However, the Gods are not hindered or limited by Their connection to the Creator God, and They are certainly not mere ornaments, names or different sides of the Creator’s personality. I accept that each of the Netjeru is broader in Their forms and powers than I can possibly comprehend, and that each of Them can be and express anything They choose to. Ultimately, the Creator God is not sole or unique or without equal, but shares Its creation with the Gods. I do not believe in god with a capital “g,” the one, indivisible god of the Abrahamic religions. Even though I was raised in a very traditional and strict Christian family, I have always rejected the idea that there is a single omnipotent “God” fueling and controlling creation. So just what does this make me? I choose to stand by the terms polytheist and polytheism, and in particular Kemetic polytheism, to describe what I believe within the limitations our language imposes on us, even though terms like polytheist and polytheism are quite obviously not ancient Egyptian in origin. How did I first come to adore the Netjeru of Kemet? I’d rather put it that They came to me, and not the other way around! My experience is that our Gods, our Sacred Powers come to us. They make Themselves known, through gestures big and small. They flirt with us, play with us…almost in a hide-and-seek kind of way. And I’m not intending to sound trivial here, to somehow cheapen or lessen the very powerful, life-altering ways in which our Gods make Their presences known in our lives. But I have always found that the Gods will find a door or a window, or a crack beneath the side door, in order to introduce Themselves and get our attention. It may be through little things at first, like a picture here or a song lyric there, or a “coincidence” that turns out to be nothing of the kind. Our Gods will find Their way into our life in ways They know will get our attention, and each person is different in these regards. 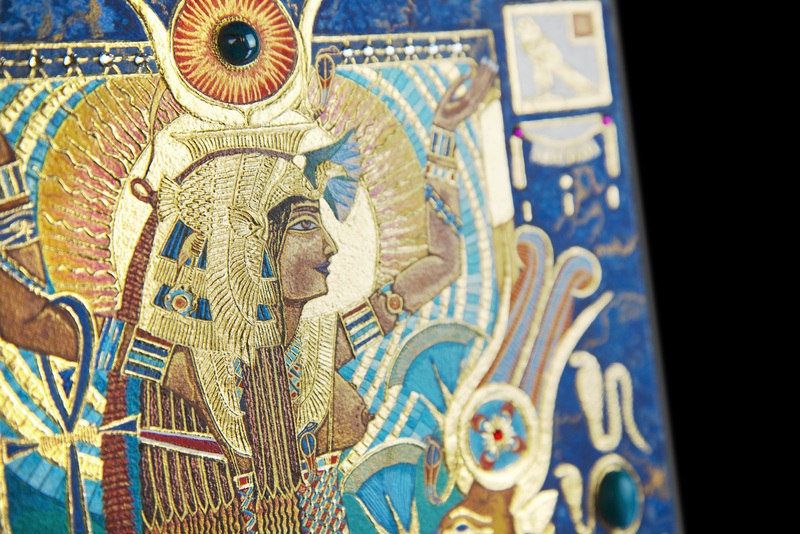 When I was six years old, I found the ancient Egypt section of the Encyclopedia Britannica, and the first thing that arrested my attention were the full-color images of Egyptian Deities, statues and reliefs, which struck a very deep chord in me. And then there were the temples. These places did not seem foreign to me, mysterious or new, but rather like places I knew, that had once been part of my life. Even at this very young age, long before I heard terms like reincarnation or past lives, I had a definite sense, an instinct or certainty, that I had once lived in this ancient culture and had served its Gods. And these Gods, too, felt familiar to me, not like mythological beings from a dead religion or defunct civilization, but Gods that were present and very much alive, active in the here and now. 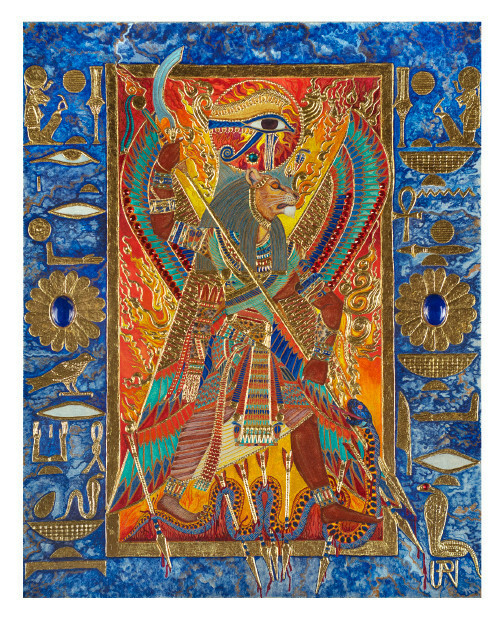 “Sekhmet, Eye of Ra” by Ptahmassu Nofra-Uaa. Used with permission. My father was a humanities major at San Diego State University, so he maintained a very well-stocked library of books on archaeology, anthropology, ancient Near Eastern civilizations, and Classical history. It was within this armory that I first found the type of books that guided my fascination with ancient Egyptian history and religion—an obsession, really. For the first three years of that relationship with ancient Egypt, I focused my attention on the Egyptian preoccupation with the afterlife and immortality, and how the Goddesses and Gods guided this framework. My father often took me to the Museum of Man in Balboa Park, San Diego, which had a very small Egyptian collection, including two mummies. I was quite preoccupied with what I perceived as a spiritual technology demonstrated by the mummification process, and in texts like the Pert-em-hru, the Book of Coming Forth By Day…The Book of the Dead. Of course, all I had access to in those days were the books by E.A. Wallis Budge, which even then were quite dated and full of errors; but I used Budge’s Egyptian Book of the Dead as a springboard for developing, through my own intuition, a personal relationship with Egypt’s ancient Gods. I always felt guided in that relationship by many pairs of unseen hands, which seemed to always direct me to the right resources at the right time. The catalyst for my real relationship with the Netjeru of Kemet—the one person of influence I can trace everything back to—is Lady Loreon Vigné, Archpriestess of Isis and founder of the California Temple of Isis. I can’t answer your question without telling how she came into my life, without giving her the credit she richly deserves. It was about six months before my 10th birthday, and my parents and I were spending an afternoon in the shopping district of historic Old Town San Diego. We discovered a fine art atelier by the name of Dergance Sculpture Studio, which specialized in the high-quality reproductions of the Tutankhamun treasures produced by Artisans Guild International. These included magnificent statues of Egyptian Goddesses and Gods. It goes without saying that I was in heaven, but finding this little studio was the single most important event in my life. Everything else that has happened to me in my spiritual life since can be traced back to the relationships I developed by way of Dergance Studio. The studio was owned jointly by a delightful senior couple, Maxine and Robert Dergance, and Maxine especially was very interested in all things spiritual, being an avid student of the Occult, and a believer in reincarnation and all things esoteric. It was from my conversations with her that I first became cognizant of the deeper meanings behind my ever-growing obsession with ancient Egyptian religion and funerary beliefs, and it was through her that I was introduced to Lady Loreon Vigné, who was in those days still called Lora. Maxine and Lora Vigné had apparently been friends for years, and it was through Dergance Sculpture Studio that Lora had acquired her generous collection of Egyptian statuary. Lora Vigné and her partner Paul Ramses had established the Isis Oasis Sanctuary and Retreat Center in Geyserville, California, which was dedicated to the exploration of ancient Egyptian spirituality and Goddess consciousness. Lora and Paul were legally ordained ministers of the Goddess Isis, and part of their mission was to reintroduce the ancient worship of Isis into the modern age. Maxine urged me to write to Lora Vigné, and the rest, as they say, is history. Lora and Paul immediately took me under their wings, helping me to develop a serious attitude in my studies of Egyptian history and religion, but also to begin an investigation into broader areas of spirituality and Occultism in general. Something that I always admired about Lady Loreon was her capacity to push the boundaries of her own beliefs and practices, to never grow into a rigid or dogmatic pattern of thinking. Loreon was a student of all the world’s religions and spiritual customs, and she really dove head-first into everything she could get her hands on. Her appetite for research and reading was boundless, and these are attitudes she strove to pass on to me when we first became acquainted. Both she and Paul sent me countless books, not only on ancient Egyptian history and religion, but also in esoteric studies and general spirituality. Lora had founded the Isis Society For Inspirational Studies, her first nonprofit educational organization, into which I was inducted around the time of my 10th birthday. Even at that very early stage, I believe that Lora and Paul had it in mind to see me eventually ordained as a minister of the Isian faith. It was certainly due to their generous tutelage that my obsession with the Goddesses and Gods of Egypt developed into a heartfelt devotion and sense of service. The Goddess Auset, or Isis, was guiding me through my close relationship with Lora Vigné and Paul Ramses. I’d say it was inevitable that I took the holy mantle as a Priest of the Goddess. Me: What is the appeal, specifically, of the Reconstructionist path as far as your personal practices go? Were you ever involved in other Pagan traditions? Ptahmassu Nofra-Uaa: The appeal of Reconstructionism for me is that it allows us to come as close as we can to the way in which our ancient ancestors communed with their Gods. The Netjeru are the Deities first worshiped by the ancient Egyptians, and it is their more than 4,000 years of experience that informs us how these Gods have manifested, how They have made Themselves known to humankind. There is a tremendous track record, if you will, preserved in papyri and letters, on monuments and in tombs, in temples and shrines, and on artifacts such as amulets, ex-votos, and stelae. There are museums and archives full of evidence for the devotional practices and cults these gods inspired for close to five millennia, and that is a huge burden of proof enforcing just how momentous a role Egypt’s Gods played in the lives of her people. And how can we simply ignore that evidence today? How is it possible for us to speak the names of these gods, to call on Them to answer our prayers, or serve Them in places we are calling “temples” in Their names, unless we first take heed of the ways in which the ancients developed such a relationship with these same Gods? We can’t possibly believe that we know better than our Ancestors, that we—especially we in America and the West, who live in societies and cultures only a few hundred years old—know better than a culture whose religious customs and traditions lasted longer than that of any other civilization on our planet. I’d say that the ancient Egyptians knew exactly what they were doing, because they had almost 5,000 years to perfect the way in which they engaged the Gods and derived blessings from Them. The rituals and sacred texts we have preserved from the temples, tombs, and monuments were passed down for thousands of years, so there is a tremendous build-up of energy in them…staying power, if you will. This may sound like a funny comparison, but just think of the way modern companies market their products: “Bayer Aspirin, since 1899.” People trust tried and tested brands that have shown their effectiveness and integrity over time, and from my point of view, the ancient Egyptian way of communing with the Netjeru has proven its case over the past 5,000 years of human history. What can we today market in its place? That’s not to say that more contemporary brands of Egyptian spirituality—Kemetic Wicca, for example—can’t offer us genuine spiritual experiences with the Netjeru; I’m not saying that at all. However, I think there’s something very pure, very powerful and primordial in the ancient and ancestral way of accomplishing sacred work. It’s a matter of getting as close to the source as it’s possible to be—and who is closer to that source? We today, or the ancients, our ancestors, who had their sacred texts and spiritual practices handed down to them in an unbroken chain from the earliest times. If we look at other ancient faiths, faiths that have survived the advent of monotheism down into the current era, we can see the immediate value in Reconstructionism. Take Hinduism, for example. The Brahmin or priestly caste of the Hindu religion is responsible for the preservation of the correct ways to perform ritual in order to attain the blessings of the Gods. Brahmins have been invested with thousands of years of Vedic knowledge and tradition, which includes the performance of sacred rites going back before recorded history. These things have been preserved because Brahmins have passed them down throughout the centuries, from priest to priest, ensuring their purity and the original seeds of spiritual potency. In ancient Egypt there was certainly this same kind of maintenance of sacred traditions within the priesthood, where knowledge of sacred texts and rituals was restricted within the priestly profession, and passed down through the temple record from generation to generation. We can see direct evidence of the longevity of Egyptian religious practices and beliefs by examining the records clearly recorded from temple to temple. There is continuity. There are rituals that existed from Old Kingdom times that we can clearly see were carried down until the Christian era. What Reconstructionism strives to do is use this continuity in the historical record to the advantage of spiritual practitioners in the current era who are trying to tap into the original sources of power prevalent in the traditional, ancient relationship between the ancestors and the Netjeru. It’s there in the historical record. We have the actual texts used by the ancestors for thousands of years. We know how to read them. In many cases we can even work out an approximation of how the ancients actually pronounced them in their own tongue. We have well-preserved temples with basically step-by-step instructions on how to carry out the rituals, with clear depictions of the cult images and instruments of worship. There is this very mistaken notion in some current spiritual circles that we have lost so much of the ancient Egyptian sacred legacy that we can’t possibly know it enough to reconstruct it accurately. That is absolutely false! We have much more available to us in the historical record than most other Reconstructionist communities. All it takes is intelligence, diligence, and a sincere desire to reconnect with our ancient ancestors. It is their tradition, after all, and since they practiced it perfectly for almost 5,000 years, shouldn’t we who follow in their footsteps give them the benefit of the doubt? I think so! Reconstructionism has given me a very solid framework for recovering and piecing back together the rich spiritual legacy left to us in the historical record by the ancient Egyptians, and this very much applies to my work as a priest of Ptah. When I founded Temple of Ptah Nevada in 2009, my goal was to piece back together the original, ancient ritual forms for serving Lord Ptah in the temple environment. wanted to find every inscription, every prayer…every scrap of information from ancient times that could help us today in our understanding of who Ptah is and how He has manifested throughout history. It was inevitable that the Reconstructionist approach would have to be adopted, and that approach is at its roots a scholastic, academic approach—researching specialist texts and volumes, scouring Egyptological theses for every reference to Ptah and his historical worship, no matter how obscure or seemingly uninformative. This search has been very discouraging at times, very enlightening at others, but it has yielded solid results that have greatly enriched my relationship with my Netjer, and my spiritual walk in general. I feel that the Recon approach has better connected me with my ancestors in the tradition, and to those ancient temples of Ptah that served the very same god I am serving now. There is this amazing and vibrant link forged with the Ancestral Powers when one is chanting or speaking the very same prayers used 3,000 years ago. It loans one’s sacred life this thread of meaning stretching back thousands of years into the distant past, which means that one is partaking of a near-limitless reservoir of divine energy, built up over the millennia. That kind of resonance is hard to come by when one is just making something up on the spot, or creating something entirely new. New can be beautiful, and so too can spontaneity; however, new ritual forms have yet to build up that reservoir of power that extensive usage over time can generate. When we create something entirely new in our spiritual practice, we aren’t necessarily connecting directly with the Ancestral Powers, which is historically very important in the worship of the Netjeru. Within the ancient Egyptian experience of the Sacred, traditions are maintained for very long periods of time without being altered, and within this ancient system there is precedence, which the Ancients believed was established in Zep Tepy, the “First Occasion” or “Time of the Gods.” Everything closer to Zep Tepy retains that holy power, which dissipates the farther you move away from the First Time. So, Reconstructionism is a valid way for us to recover our ancestral links and engage the most ancient practices through which the life-giving, life-affirming blessings of our Gods may be engendered. “The Father Ra” by Ptahmassu Nofra-Uaa. Used with permission. My one word of caution concerning Reconstructionism is not to fall into the trap of taking the religious experience and making it something of an intellectual experiment. I have encountered this a number of times over the years in my Kemetic work, where individuals and groups are so adamantly opposed to any experience or element that falls outside academic scholarship, that they wind up creating a very artificial experience of Kemeticism, much more akin to historical reenactment than to a living spiritual tradition engaging living Gods. The scholastic record is very deep, and Egyptologists have certainly given Reconstructionists a vital legacy in the reclamation of our ancient rites and authentic texts. However, we must remember that religion and spirituality are living and organic frameworks for communing with the Divine. Without heart, without intuition, faith and feeling—without reverence and a direct relationship with the Gods, one cannot grow spiritually or be fed by the Sacred Powers. This has to come from the heart, not solely the head. Our cerebral capacity alone cannot give us a window into the Divine world. That requires a certain amount of faith in that which we cannot quantify or measure. That means we have to set aside the books and the brain, and hit the temple floor with the service of the heart. If Kemetic Reconstructionists refuse to acknowledge that our Netjeru are living Gods, active in the here and now, working through the very world we are currently inhabiting, then we run the risk of taking these sacred rites and reducing them to nothing but so much mummery…ye olde Renaissance faire in ancient Egyptian getup. I have attended Reconstructionist rituals that sounded more like an Egyptology symposium than anything religious or mystical, and there is absolutely nothing more useless to the human soul than dressing up mere historical reenactment and daring to call it authentic religion. The Netjeru are not limited to one specific time frame or mode of worship. They are under no obligation to follow even the most ancient words or formulas, if these are used in any way other than to glorify Them. You can take an authentic text and follow it to the letter, but if you do so without heart, without feeling and genuine reverence, the Gods will refuse to be engaged, and your work will ring hollow, without any truly fulfilling, lasting response. Many people who know me in a strictly Kemetic context may be surprised to hear that not only have I been active in other sacred traditions, but am to this day initiated in non-Kemetic traditions, and offer devotion to other pantheons. If by “Pagan” you are referring to Neopaganism, Wicca, Witchcraft or Western Occult traditions, the answer is no. I have nothing but respect for these other traditions, for the Craft and like-minded paths, but I have not devoted serious time to studying them, nor have I practiced them, simply because they have never called to me personally. I have always been, from the very beginning of my religious and spiritual life, called by the pantheons and cults of the Ancient Near East, the Mediterranean world, and to some systems of South Asia, namely Tibetan Buddhism and Hinduism. I am also a devotee of the Religio Romana or pre-Christian religion of Rome, and have an affinity for some of the Deities and practices of the ancient Hellenic religion. Me: Do you feel that polytheism should be incorporated under a broad, encompassing “Paganism,” or should it be its own tradition distinct from Paganism? If distinct, how do you see the communities relating to each other? Ptahmassu Nofra-Uaa: This is a complicated and controversial question. If by “Polytheism” we agree that this refers to all traditions that accept the validity of many Gods—that include the worship of many Gods as a vital component of their identity—then yes, in these regards, we might very well label all Polytheistic traditions as “Pagan.” Academics certainly do when they are referring to the ancient pre-Christian religions of humankind. Academics almost always refer to all pre-Christian and/or non-monotheistic beliefs as “Pagan.” However, they mean pagan not with a capital “p,” as is used by modern adherents of Neopaganism, but as in “not Christian,” “before Christianity,” or Gods and practices falling outside the domain of the Abrahamic faiths. My personal experience is that many individuals who refer to themselves as Polytheists try to distance what they believe and practice from the labels of Pagan and Paganism, simply because so many people instantly associate these terms with Wicca and Witchcraft, which are in many ways very different paths from, say, Hellenic Reconstructionism or Heathenry. There has also always been a rather negative connotation tacked on—admittedly very unfairly—to the term Pagan, as used historically by Christians in order to denote and slander those not belonging to the army of Christ. How about we start with respect? It all comes down to respecting the choices of others to belong or label or identify themselves in the way that is healthy for them as individuals. We may choose a different path or expression from others, but there needs to be a basic respect for the right of others to choose, just as we have our right to choose. This seems to me to be the best way to form healthy spiritual communities—communities that are strong and can accomplish Sacred Work more fully together, as peers and equals. I think it would be near impossible, and perhaps undesirable, for all who define themselves as Polytheists to be lumped together under one communal umbrella of belief. Even within Reconstructionist communities, such as Kemetic and Hellenic, there is fierce debate concerning use of the term “polytheism.” Multiply this by the number of groups, communities, and individuals who might identify themselves as Polytheists, then add to that the number of people who subscribe to both Polytheist and Pagan identifications, and the question of one or the other just gets drowned in the hubbub over what Polytheism is; how a belief, group or individual practitioner fits into the dictionary definition of polytheism, as opposed to a less clinical understanding of Polytheism as understood in contemporary spiritual circles. At the end of the day it all sounds like a bunch of noise to me, truth be told. Once again, I think we can get so caught up in the use of labels, identifications, and definitions of belief that we lose sight of our higher spiritual aims and Sacred Work. In my estimation, both Paganism and Polytheism serve very similar aims, and those are service to the Gods, and service to creation through communion with the Gods, together with our ancestors. Ultimately the philosophical ramifications and debates must take a back seat to the work of actually engaging and honoring the Sacred Powers. If someone’s idea of spiritual work is sitting in a corner and arguing over “Polytheism” versus “Paganism,” should we or shouldn’t we, then I’ll opt to excuse myself so that I can get busy getting down to the real work of honoring my Gods and ancestors. Me: What role, if any, do you think Reconstructionist faiths should have in interfaith ambassadorship? Have you personally been involved in such initiatives? Ptahmassu Nofra-Uaa: Personally, I feel that all faiths should take some kind of role in interfaith dialogues, whether that means taking part in a formal interfaith initiative, or simply engaging members of other faiths in discussions and activities from which mutual cooperation and understanding can grow. My experience is that when we invest our interests not only in personal interest, but in the interests of others in the wider spiritual community, we bolster our own personal experience of faith, and create a way for others to understand sacred experiences outside the scope of their own traditions. When we do this, it helps create awareness and tolerance, which can help to combat prejudice, discrimination, and violence between people of different faiths. Interfaith dialogues have enriched my own appreciation for the traditions I follow, but have also helped me to broaden my perspective, and avoid getting boxed in by closed-mindedness. Many years ago, when I first began my public spiritual mission, an important part of the work I was doing as a spiritual practitioner and priest was interfaith work, including initiatives for nonviolence and human rights. I had been greatly encouraged in my desire to engage in this kind of work by His Holiness the Dalai Lama, whose interfaith message and teachings on nonviolence have always had a profound influence on my own ethical perspective. I was invited in October of 1999 (and again in June of 2000) by the Office of His Holiness the Dalai Lama to take part in a series of teachings the Dalai Lama was giving, which I attended in the capacity of visiting clergy in the spirit of interfaith cooperation. The teachings and initiations I received from His Holiness were a significant part of the personal mission I felt was guiding my budding vision as a humanitarian practitioner. My vision was not only to call for a restoration of the ancient Egyptian spiritual traditions, but also, in a wider perspective, to call for a unity between the practice of religion and human rights ethics—that one could not be separate from the other. In my view, I saw this also as the practice of restoring Ma’at in our world, in cultivating a feeling of solidarity between people of differing views, which could only help in advancing the work of the Sacred Powers. These are all still goals I place at the center of my spiritual practice, which I always strive to include a broader view of the world in which I live and engage. What I’d really like to see happening is more interfaith dialogue between the various Reconstructionist faiths, and far more cooperation and support between different Kemetic communities. My experience in Kemeticism—both general and Reconstructionist—is that there tends to be a great deal of argument, banter, and disunity between various groups and temples. So much of the fuss seems to be centered around whose version of Kemeticism is the authentic one, or more authentic, or the real thing. Whose interpretation of source texts is correct? Who is using the “right” scholarship to reconstruct the traditions? Which groups have the “real thing,” and which groups don’t? There is a lot of mud-slinging, accusation, and argument taking place that has very little to do with devotion to the Netjeru and Ancestors, and mostly to do with the human ego. Far too much of an emphasis is being placed on source texts and belief, in my opinion, and not near enough emphasis on Sacred Work, cult, devotion, and engagement of the Sacred Powers. After a number of years of trying to connect with other Kemetic groups online, I eventually backed away from online communities entirely, and have concentrated all my effort on building an actual physical cultic house and practice…a hands-on approach, as opposed to a virtual one. Me: What advice do you give to spiritual seekers who say that they’d like to “work with” a given Deity, as opposed to cultivating a personal devotional relationship with that God or Goddess? Are there ever instances where having a “contractual” relationship with a Power is okay? If not, why not? Human beings are charged with the task of co-creating with the Gods, keeping the wheels of creation turning properly through maintenance like performing the Daily Ritual. The Daily Ritual is not just “worship” in the contemporary sense of the word, but is actually the vital process through which the cosmos is balanced and directed in a steady course. The ritual episodes of the Daily Ritual are the spiritual technology for engaging the Gods as co-creators with humankind. Each gesture, each set of prayers, each formula, and offering is an integral part of the “work” human beings need to do in order to create harmony with the Gods, which ripples outward to effect the entire created world. So in these regards, “work” is a creative, co-creative process between humankind and the Gods. “Work” means Sacred Work, the labor of engaging the Gods and the ancestors for the benefit of all created things. However, I know you’re asking about “working with” the Gods in a way that reads as a strictly business-like, “contractual” relationship, which can sometimes mean the exclusion of a deeper devotional relationship. I’m not fond of “contractual” relationships with Deities, and here’s why. Let’s think about our human relationships and how we define them. We have acquaintances, people we know in a casual manner, perhaps like, but don’t necessarily include in our circle of friends—people we might depend on or enjoy spending quality time with. Then we have people we consider our friends, individuals we actually spend quality time with, share mutual interests with, and generally trust. And then there are those people we have as part of our inner circle of friends, people we might even call our “family,” though there are no blood ties between us. The definitions grow more and more intimate as we define our very best friends, lovers, spouses, and blood family. Think for a moment on how different each of these relationships are, and what each of them contributes to our overall life. Now let’s apply this outlook to Deities. Our relationships with our Deities are a two-way street. We are hopefully asking Them to engage with us in a manner that meaningfully contributes to our experience of life, a manner that actually enriches our life and empowers us in every area. We have wants and needs and desires, and we’re asking the Goddesses and Gods to fulfill these. We have “work” to do, and we’re asking Them to help us do this “work,” and sometimes we’re asking Them to do all the “work” for us. But do we ever stop to consider that the Gods we’re invoking and asking for help are expecting us to meet Them half-way? Do we ever anticipate that the level of effort or involvement we bring to the table is going to determine how much our Sacred Powers actually listen to and give us the help we need? Or are we just taking for granted that because the Gods are Gods that They’re going to snap to and give us everything we want, simply because They can? Well, my personal experience over the past 35 years tells me that the Gods are here to help us and to give us the things we want or need. es, They will give us what we ask for, and They have the power to do it. However, the Gods expect us to meet Them half-way, at least, and They are going to respond in the same manner as we present ourselves to Them. People who use the Gods as some kind of cosmic vending machine are going to find out sooner or later that the Gods stop listening to them and engaging. If we are going to treat Them casually, then They are going to treat us casually. “Doorway to My Heart” featuring the Neter Hwt-Her (Hathor) by Ptahmassu Nofra-Uaa. Used with permission. So, your casual acquaintances, the people you know but don’t consider your closest friends; why don’t you consider them as part of your inner circle, as part of your family…people you know you could depend on in a serious crisis? Probably because your relationship with them is merely polite, casual, friendly—but not a truly deep friendship. Maybe you say hello once in a while, or ask them how their day is going. You might see them at work, and now and again exchange a few words. But who are you going to call when you need someone to really be there and pick up all the pieces for you? You’re going to call the people in your life who have shown you by their effort and actions that they will be there for you and can be completely trusted. We don’t like to think of Deities as having these same kinds of discriminating faculties we recognize as being all too human, but They do, and They use them! If we want our Deities to listen to us, be there for us, rescue us, and give us the things we ask for, then we have to be willing to step up to the plate and give Them our time, sincerity, offerings, and respect. Without these things as a foundation, the Gods are going to treat us just as casually as we treat Them. If we merely acknowledge the existence of Deities, then They are going to merely acknowledge us. They are going to return exactly what we’re willing to give to Them. Our relationship with our Gods has to come from a genuine effort of cultivation, where we bring our true selves into the dynamic in order to establish a foundation of trust and love, a bond that manifests the blessings of a true and mutual exchange. The ancients operated according to the premise of we give because You give, which defines an interdependent system of reciprocity. The Gods give human beings boons, and human beings offer those things back to the Gods. The Gods, then, respond in the self-same manner, bringing human beings the essence of life, materially and spiritually. But it has to come from both sides. Both Gods and human beings have to meet one another in the middle, otherwise Sacred Work cannot be accomplished, and you will be left with a very one-sided partnership. My experience with people who are “working with” the Gods has often left a bad taste in my mouth, because far too often I see people jumping from pantheon to pantheon every other week (I call them “dharma faeries”), “working with” the Gods in a very skin-deep or superficial manner. I often see these people treating the Gods like a cafeteria, grabbing all the bits and pieces they like, without paying for any of it. Oh, this week I’m “working with” Athena, and next week I’m “working with” Kali. It all gets very superficial, because instead of actually taking the time and pains to develop a solid relationship with the Deities they’re invoking, taking the pains to learn what the Deities like to receive within Their traditions, people are just snapping their fingers and making demands, then moving on to the next best thing. I think this kind of spiritual outlook is deeply disrespectful to the Gods, and potentially self-destructive to the people engaging in it. But then again, it all depends on how much you ultimately wish to receive in your interactions with your Gods. You’re going to get no better than what you give, and if you want to grab and go, the Gods are going to grab and go, too. It works both ways, so people need to be conscious of this, that the Gods charge interest on the things we take from Them without bestowing anything in return. The Gods give with one hand, and take with the other. My honest advice is to check your motives and know your own intentions before approaching any Deity, before choosing to “work with” a Goddess or God. Be very careful how you ask for the things you want or need, and be prepared to meet the Deities on Their terms, which I think is very difficult for “dharma faeries” to do. What do I mean by meet the Deities on Their terms? Gods and Goddesses of all pantheons have a cultural and spiritual framework within which They are used to operating. This is another thing so many people seem to ignore or be unaware of. Each Deity has demonstrated to Its devotees throughout history the ways in which She or He likes to be engaged. Deities have favorite foods—oh yes, They do! They have colors, textures, smells, and sights that have been part of the celebration of Their existences since the beginning of Their structured worship. Hellenic Deities have a very different flavor and set of expectations than Kemetic Deities, or Norse, or Hindu. These are very ancient pantheons, whose desires have been made known and passed down from generation to generation. There’s a reason why—when you examine the devotional track record of any given Deity, devotees have brought the same type of offerings to the same Deity over very long periods of time. These aren’t accidents. These aren’t human beings just projecting their own limited framework onto Deities. These things become traditions, become part of a Deity’s cult because the Deity has indicated, through the bestowal of boons, that such and such an offering is pleasing to Her or Him. The same applies to cultic gestures, ritual music, cult images, temple sites, and so on and so forth. Cults are developed through an intimate exchange taking place between people and their Gods, and these things shouldn’t be so lightly swept aside if we wish to continue having meaningful relationships with these same Deities today. So, I have to advise people to take some time to learn about the Deities they are going to “work with,” if they’re going to develop a “contractual” relationship with Them. Demonstrate your respect to that Deity or Power by doing your due diligence, as it were, within the tradition that Deity has been operating in. Learn the offerings that have been part of that Deity’s cult, and have enough respect for these traditions to make a basic effort to include them in your “contract” with the Deity. I don’t think this is rocket science I’m talking about. It’s about basic respect for the Sacred Powers. How can someone demonstrate to you his sincerity to really be your friend? By learning your favorite foods, bringing you your favorite Godiva chocolate on your birthday, knowing your favorite movies, et cetera. The Gods are the very same way. If you want to get Their attention, bring Them the things They love, the things They’ve always wanted—especially if you’re going to ask Them for something in return. People who “work” generally get paid for their labors, and those people wanting the Gods to “work with” them or for them have to be willing to pay for the things they’re asking for. It all comes back to we give because You give. Me: You’ve recently launched a business called Icons of Kemet. What prompted you to launch it? What words of advice can you give to people who want to transition to spiritually based entrepreneurship? How has the interaction of business concerns and a spiritual ethos been playing itself out for you? Ptahmassu Nofra-Uaa: My journey with Icons of Kemet began a number of years ago. In 2009, I co-founded Temple of Ptah Nevada as a Kemetic Reconstructionist temple devoted to the restoration of authentic ancient Egyptian spirituality, and part of that work, quite naturally, is the revival of Kemetic iconography or cult images. As a priest of the God Ptah, I regard it as a vital component of my Sacred Work to revitalize the energetic link that has always existed between the Netjeru and Their historical iconography. Icons or cult images are much more than mere symbols or reminders of a Deity’s presence and powers; they are, in fact, physical and living embodiments of that presence and power, open channels through which the Netjeru maintain Their activity within the domain of Sacred Space. In a “business” sense, the creation of Icons of Kemet is the outcome of two key factors in the continuation of my Sacred Work. The first is the simple fact that devotees of the Netjeru need to have access to Sacred images for use in their worship. It is by way of such images that individuals and temple communities can know they are activating Sacred Spaces for their traditions, and are honoring the Netjeru by maintaining the images of the cult. So, in these regards I wanted to provide the highest-quality images of the Netjeru that could continue to serve the Gods and Their devotees in the contemporary world. Secondly, I realized that the Gods had given me a valuable gift, not only as a means of celebrating Their cults, but also in eventually being able to financially support the temples my husband and I are on a mission to build. You know, DeTraci Regula, Archpriestess of the Temple of Isis in Geyserville, California, said something during the 2014 Isis Symposium that has stuck with me every day since. DeTraci was giving a lecture about the continuation of the ancient temples today, and she said that each one of us—as priestesses and priests— came into this world with a unique gift that was ours alone, and that this gift was something that only we could do, and that if we didn’t do it, it wouldn’t get done. What we needed to do, she said, was find this gift, develop it, and let that be our path to service. Very wise words! I think I reached a point in my work a few years ago when it dawned on me that I was sitting on the means to cultivate financial prosperity for our temples, and that was my gift as an iconographer and painter. If I could eventually generate enough interest in my work, I could not only satisfy the needs of the Kemetic community to have special images of its Gods, but at the same time put those images to work in support of our temples. Sure, I could go out and try to find a “normal” day job and try to use that income to fund some of our temple’s goals, or I could use the skills the Gods gave me to celebrate Them and sustain the revival of Their traditions. The fine art market has opportunities for unique work, and there are patrons out there who will pay huge sums of money for the kind of work I’m offering—and what better way could I find to bring in an income for our Sacred Work, than by using the very images of the Gods to help make Their modern temples a living reality? That is our ultimate goal, as far as a “business” focus is concerned. I think spiritually based entrepreneurship is a very noble pursuit, but it is also a tremendous risk, and a painfully difficult concept to make feasible in today’s economic climate. The only reason I’ve been able to devote my working life to Icons of Kemet is because we have a full-time income from my husband’s career to support our life’s needs; otherwise, there is no possible way I could be maintaining my current vocation. It’s a very difficult trade-off because it means making sacrifices of things we really want in the short run so that we can manifest the bigger picture. My advice to others is to first take a good, hard look at your goals and priorities and organize your business plan accordingly. I would also strongly suggest making sure you have some secondary form of income flowing regularly into your household—an income source you can wholly depend on. That way, should something go wrong, or the profitability of your business not manifest, your household will still be secure. Also, don’t limit the possible financial success of your business by being closed-minded to generating the highest possible income from your endeavors. There seems to be this attitude in the spiritual community at large that making money is a negative activity, and that to be spiritually ethical one must somehow be impoverished, or hand out one’s assets for next to nothing. I face this constantly in my work, where people somehow feel that because I’m an iconographer, and my work is “religious,” that it somehow has less value, and should be just handed out. People have this mindset that if it’s spiritually sound, it should not be given a monetary value. I’m definitely not one of those people! My experience is that so many people in the Neopagan, spiritual community believe they have this innate right to everything spiritual, and that if someone is asking for financial compensation for their spiritual work, they are doing wrong. I think the moral wrong is actually in the reverse, to actually expect a person to deny their right to make a living and support their household just because their vocation or business has a spiritual focus, which you feel you have some right to. Everyone has a right to food, clothing, and shelter; to pay their rent or mortgage; support their family and obligations; and pursue their path to personal happiness. We live in a society that requires money for everything, and we can complain about that, throw a tantrum about it and fight it, or we can find ways to make that system work for us and our higher, spiritual goals. That is exactly what I’m doing, and I think it requires a thick skin, a strong vision, and enough personal strength to go against the grain, even of one’s spiritual community. That’s very cool! Thank you for stopping by and reading my post. Blessings!